Happy New Year, again, to you all! It’s time for the first book recommendation of 2010 – a true classic. The unofficial “father” of the life coaching industry, Tony Robbins has long been a household name. And in my opinion, rightfully so. His book Awaken the Giant Within: How to Take Immediate Control of Your Mental, Emotional, Physical and Financial Destiny! has been acclaimed by many respected leaders as “must read” material. Written in 1992, the book examines a large range of topics including goal-setting, neuro-linguistic programming (NLP), relationships, and personal finance. To this day, many people credit Robbins and this book in particular for their financial and personal success. Awaken the Giant Within is a practical, easy-to-read, life-changing book, which enables all of us to grasp the tools to release our full potential and awaken the giant in us all. Does this quotation sound familiar? Often mistakenly attributed to Nelson Mandela, it is really the brainchild of Marianne Williamson, a spiritual activist, author, and lecturer, who has become something of an American Guru. Perhaps the biggest selling self-help book of all time, A Return to Love was one of the first books ever endorsed by Oprah Winfrey and spent more than 39 weeks on the New York Times best sellers list. 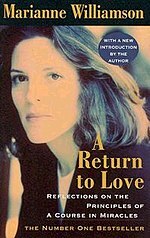 Her first of nine books, A Return to Love is based on her experiences as a teacher and lecturer on the self-study guide A Course in Miracles. Williamson shares her insights into how the practical application of love every day can provide an answer to the problems that confront us, whether these are in our relationships, our careers or our health. The book is honest and inspiring, and it has changed many lives. Some have even described it as unearthing a treasure. We often forget that the concept of joy is also a part of the human condition. William explains that we must cultivate happiness. You may have noticed that I have a new column of recommended books in my sidebar. These are some of my very favorite, and I’m thrilled to be sharing them with you! Listed in no particular order, I’ll be going through and talking a bit about them. First up is A New Earth: Awakening to Your Life’s Purpose. 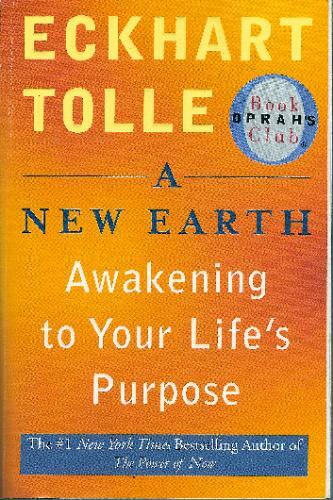 The author of the incredible The Power of Now, Tolle’s A New Earth is a #1 New York Times Bestseller and was chosen by Oprah Winfrey for her book club. In this book Tolle gives us the tools to get us to the place where we understand the benefits of raising our awareness, and more importantly, he actually gets us to want to do go do it. According to Tolle, who assumes the role of narrator as well, humans are on the verge of creating a new world by a personal transformation that shifts our attention away from our ever-expanding egos. This idea is well realized through Tolle’s remarkably well-paced narration. Naturally, the author understands his material so thoroughly that he is able to convey it in an enjoyable manner, but Tolle’s gentle tone and dialect begs his audience’s attention simply through its straightforward approach. Something about this reading just seems profoundly important, whether one agrees with the material or not, and listeners’ attention is sure to be captured within seconds of listening to Tolle’s take on the universe in which we live. Originally released in 2005, both book and audiobook were reissued when Oprah Winfrey chose the title for her book club this year.